Who can understand the mind of a preschooler? You can! Know that above all else, a preschooler is a learner. His amazing powers of reasoning and discrimination are awakened through a world of play and imagination. Through home relationships, he learns about love, trust, comfort, and security; through friends he learns to measure himself against a world of peers; and through unconditional love, a child establishes his own unique selfhood. The growth period between ages three and five years is all about learning, and On Becoming Preschoolwise is all about helping parents create the right opportunities and best environment to optimize their child's learning potential.Now influencing over two million homes worldwide, trusted parenting authors Gary Ezzo and Dr. Robert Bucknam once again bring their collective wisdom, experience, and insight to bear on this critical phase of preschool training. From teaching about the importance of play to learning how to prepare a preschooler for the first day of school, from organizing your child's week to understanding childhood fears and calming parental anxiety, sound advice and practical application await the reader. You will find this resource as practical as it is informative, curative as much as it is encouraging. - Publisher The millions of parents who have already trained their babies with Ezzo's "On Becoming Babywise" will now get rare and helpful insights into the raising of their preschooler. Ezzo offers an exclusive look into the most sensitive and ordinary techniques that he has used which parents have found effective. - Publisher Preschoolers are just fun. They know enough about life to enjoy it with enthusiasm and gusto, but not enough to survive very long without supervision. They are independent, but would never want to be left home alone. They live on praise and encouragement, but a single stern look can bring them to tears. They can be shy and timid one moment, yet confidently insist, "I can do it " the next. They possess a ferocious appetite for play and order their lives according to the single principle that nothing is too difficult "for me." Play is their world and their tutor, taking them to the land of discovery that only ceases each night when they close their eyes in peaceful slumber. 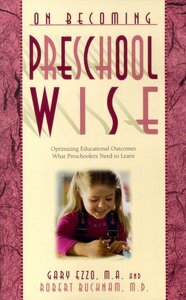 About "Preschool Wise (On Becoming Series)"
The millions of parents who have already trained their babies with Ezzo's "On Becoming Babywise" will now get rare and helpful insights into the raising of their preschooler. Ezzo offers an exclusive look into the most sensitive and ordinary techniques that he has used which parents have found effective. Preschoolers are just fun. They know enough about life to enjoy it with enthusiasm and gusto, but not enough to survive very long without supervision. They are independent, but would never want to be left home alone. They live on praise and encouragement, but a single stern look can bring them to tears. They can be shy and timid one moment, yet confidently insist, "I can do it " the next. They possess a ferocious appetite for play and order their lives according to the single principle that nothing is too difficult "for me." Play is their world and their tutor, taking them to the land of discovery that only ceases each night when they close their eyes in peaceful slumber. Medical research continually develops better ways to manage labour and delivery for healthy outcomes. With all of the choices, theories, and plethora of ideas available today, it's a challenge for expectant parents to know where to turn for wise counsel. ON BECOMING BIRTHWISE has the answers for you. Stemming from a childbirth course created in 1989 by a group of healthcare providers experienced in labour and delivery, this book is a must-read for every expectant parent. The authors explore the medical options available, from high-tech intervention to natural childbirth. You will grow in your understanding and appreciation of the physical and emotional transitions taking place during your pregnancy and at each stage of labour. Similar to the other seven books in the this series, ON BECOMING BIRTHWISE is informative, practical, and easily understood, and perhaps most importantly, written from the hearts of mums who are also medical professionals. The Birthwise method builds confidence in expectant parents and helps them to have a satisfying birthing experience. Parents seek to raise moral and godly children, but many don't know how. ON BECOMING CHILDWISE offers parents of children aged three to seven helpful and biblical advice on discipline, communication and respect. Gary Ezzo, author, pastor and father, and Robert Bucknam, paediatrician, draw from their professional and personal in-the-trenches experience to offer practical instruction on raising morally responsible children. Part of the dynamic ON BECOMING parenting series, PRETEEN WISE will be instantly recognised by readers who have trusted the Babywise and Childwise books for wisdom on child-rearing. Moving into the preteen years, parents of eight- to twelve-year-olds face the challenge of transition from wielding adult authority to using personal influence to motivate their children. Authors Gary Ezzo and paediatrician Robert Bucknam give parents communication tips and effective ways to insulate their child from peer "groupthink". They discuss seven warning flags and how to respond to them. This is a book for all parents seeking an atmosphere of mutual respect in their home, non-rebellious teen years and a future friendship with their grown child. Wonderful news for worried parents! "Parents can raise great teens without the fear of storm and stress," say Gary Ezzo and Dr. Robert Bucknam. These parenting experts and bestselling authors explain that parents need not expect rebellion and conflict during their children's adolescence. The authors offer practical how-tos for building a positive relationship that leads to teen years marked by excitement, respect, and smooth family interaction. They show that the key is learning to build bridges to your teen's heart, and creating a strong family fabric that lasts well beyond the difficult teenage years. The toddler years are an amazing learning field, and you need a trustworthy guide to take you through the unfolding maze of your child's developing world. ON BECOMING TODDLERWISE is a tool chest of workable strategies and ideas that multiplies your child's learning opportunities in a loving and nurturing way. This resource is as practical as it is informative. Trusted parenting authors Gary Ezzo and Robert Bucknam bring their collective wisdom, experience, and insights to bear on this critical phase of growth and development. From first steps to potty training made easy and everything in between, it is all here for you in this valuable book.